Greenfinches have expanded their range to fill in most of the gaps in their distribution at the time of our First Atlas, across all the agricultural region of southern Cheshire and most of the eastern hills. They were found in an extra 71 tetrads, with 12 losses, a net gain of 59 tetrads to become the eleventh most widespread species, present in 639 tetrads. It was also the eleventh most abundant according to the BTO’s analysis of Breeding Bird Survey transects, with a breeding population of Cheshire and Wirral in 2004-05 of 49,950 birds (38,170-61,720). This spread in their distribution probably reflects the national rise in population: the index is now 55% up on its low point, around the end of our First Atlas. Like most seed-eaters, Greenfinch populations dropped between the mid-1970s and mid-1980s, but their numbers fell much less than those of other species, only by about 20%, probably because they eat a much wider range of foods. The abundance map, as for Goldfinch, shows lower densities of Greenfinches in the more newly-colonised areas, with highest numbers in the north and west of the county. The submitted habitat codes came mainly from human sites (43%) and farmland (34%), with 14% in woodland and 8% in scrub. As many as 27% of the records were from rural human sites (F3) and the surest way to find Greenfinches, on visiting a tetrad, was to go to the edge of a village, next to an overgrown hedgerow. The birds usually give away their presence with their monotonous wheezing calls, and often breed in loose colonies, with several pairs within a small area, all sharing the same feeding sites. Adult Greenfinches feed their chicks by regurgitating seeds, with small chicks getting a few invertebrates as well, and in 48 tetrads observers recorded adults taking food to, or faecal sacs from, their nestlings. Nests were recorded in 55 tetrads, a bulky construction usually deep within a hedge or thick shrub such as an evergreen, hawthorn or elder. Family parties with dependent young, accounting for 241 of the tetrads with confirmed breeding, are commonly found around the middle of June. Steve Hind reported birds at Higher Poynton (SJ98L) on 2 July 2006 that were feeding their young on cherries. Mean laying dates are as much as two weeks earlier than forty years ago, probably driven partly by climate change (Crick & Sparks 1999) and also facilitated by year-round use of gardens for feeding. 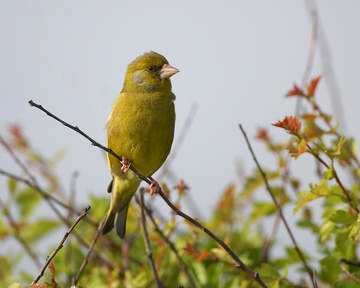 April is usually the toughest month for Greenfinches, with highest adult mortality as natural food supplies are at their lowest, and provision of extra food for them can make a significant difference to survival and, if the adults are in good condition, allow an early start to the breeding season. Some individuals can be much earlier than the average – I found fledged young in Acton Bridge (SJ67C) on 7 May 2006 whose parents must have started nesting in March – and the products of late broods can still be in juvenile plumage into October or, exceptionally, November, as with a bird ringed in my garden (SJ57K) on 9 November 2005.